Holy cow have I been busy lately. So much self imposed fun. I came across this article last week and have been thinking about it. Aregadgets making you dumb? The basic premise is that my having information at our fingertips, we don’t need to use the portion of our brains that remembers things like phone numbers or addresses. It is all saved in our cell phones or PDAs. And the less you use your memory, the worse it gets. This may be reflected in the survey findings which show that the over 50s who grew up committing more to memory report better performance in many areas than those under 30 who are heavily reliant on technology to act as their day to day aide memoir. I thought it was especially funny that 45% of men could not remember their wedding anniversary, while only 10% of women could not. I have already showed you the itemized grocery store list that my husband created. This is another one of his creations. 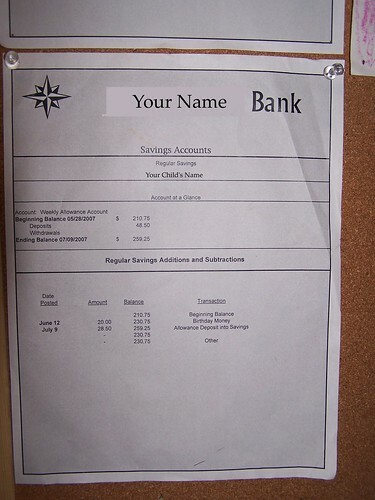 A way to keep track of allowance. And he makes it so pretty. Some people have expressed a desire to see what the bank statements look like that we give our children. This is a photo of one belonging to my 10 year old son. Everything is itemized the way that it would be in a real bank statement. He received birthday money in addition to his allowance, and he made no withdrawals from his savings to buy things. Withdrawals would be listed with exact expenditure and the date. Additionally, we really do have a bank account at an actual bank where their money is collectively saved. Every week my husband transfers their allowances into the single account ($26.50 each week), adds in any additional money earned through extra chores or birthday money, withdraws expenditures. This system of payment has been the best for us. No cash to lose. No trying to remember how much money each child is owed. Encouraging them to save and watch their bank accounts grow. As the longest season of the year (baseball season) wraps up here I realized I never posted a great idea I had about keeping drinks cool for sports players. My son has long days at the field, sometimes in 95 degree weather. He has a large thermos with a drinking spout on top that he brings with him, but in the hot weather even an insulated thermos can’t keep the liquid cold for hours. We take small round tupperware containers and freeze solid blocks of gatorade in them. This way as the ice chunk melts it isn’t watering down the drink and a big solid chunk of ice takes linger to melt and therefore keeps the gatorade colder longer. Are you all still awake? I have a series of three posts up over at my handipoints blog. Want to go and read about ways we like to stay cool and have fun during this “scorching” heatwave? Please? I am awfully lonely over there talking to myself… myself…myself. I frequently get emails asking me about my camera. And well, they don’t make it any longer. This is the camera that I have. It isn’t a terribly wonderful camera. It is about two years old and I paid right around $400 for it at the time. I am usually happy with it. There are features I wish it had, like image stabilization. And the shutter speed is not as fast as I would like, which means in low light I often get blurry photos. And I still covet an SLR. How do you decide what camera to buy out of the all the choices out there. What should you look for? What is important to you? And how much are you willing to spend? And instead of recreating a list here, I’ll direct you to this list where you will have questions to consider before buying a camera. And THEN go to here where you can input what is important to you and the website will offer you recommendations based on your answers. This website offers extensive reviews of just about every camera they make. I read this article last week and honestly wondered why it was such a surprise. I have been thinking about it quite a bit, running the results through my head. In the end I realized that I don’t have much to say about it, but wonder what everyone else thinks. I personally think that children are more a source of stress in a marriage than one of the factors of a successful marriage. Perhaps this apparent change of attitude is more of a recognition of how demanding parenting really is. I also wonder if in the past surveys people answered the questions the way they thought they should answer it, rather than how they really felt. Sort of like that same phenomenon where people vote for the person they think will win. Why didn’t I ever know about this? Did you know that during the summer select movie theaters offer free admission for a children’s movie, or two, per week? You probably did. I, however, have been nice and comfortable here under my rock. AMC Theatres offer a free movie on Wednesday mornings all summer long. Regal Entertainment Group Theatres offer selected G & PG movies start at 10AM each Tuesday and Wednesday during the festival. First-come, first-served seating is limited to theatre capacity. This group of theatres offers two movies simultaneously. I wish one of these was close enough to make it worthwhile for me to bring my children on a regular basis. Such is the curse of living in the middle of nowhere. I think things like this are especially appealing to those of us with children who might not be quite old enough to go to the movie theater. My 2.5 yr old might sit through an entire movie without leaving his seat. But he is also might be just as likely to get up and try to run up and down the aisle. At these free showings there is a lot of young children, no one is expecting complete silence, and if it gets so bad you have to leave the theater, well you haven’t lost any money. Remember to check out your local theaters too. It is always possible that they are doing something similar to lure you in their doors where you will buy the overpriced concessions. You are currently browsing the A Year Off weblog archives for July, 2007.